Earlier this week, it was my pleasure to attend the 2015 Michigan Association of Insurance Agents (MAIA) annual convention in Mt. Pleasant, Michigan. The accompanying photo captured Ferris students Jay Miller, Corey Bledsoe, and Cody Simons, along with yours truly, Dr. David Allen Brown in front of the Ferris State University booth in the exhibit hall. The educational and experiential benefit for the students in attendance was very apparent, and all three students shared with me how valuable this conference was to them. They were able to network with many industry professionals (many of whom are eager to hire them upon graduation! 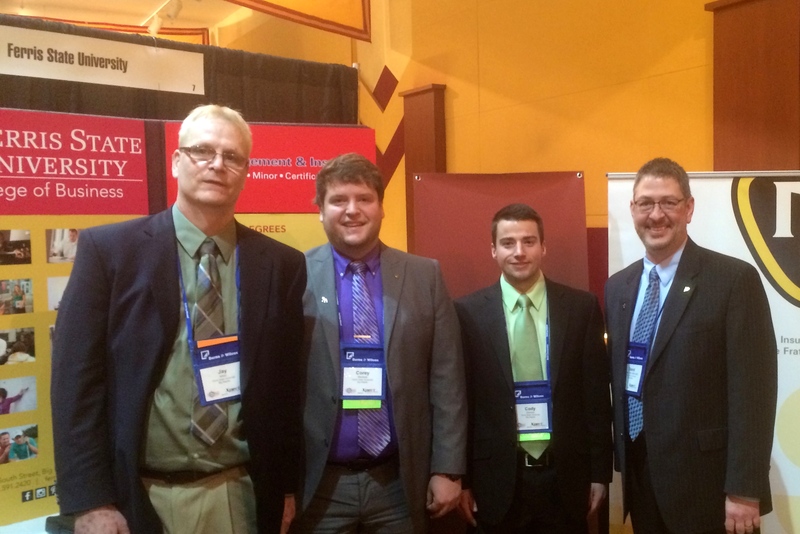 ), and also with fellow students from the Olivet College insurance and risk management program. The convention offered educational sessions on topics that included ethics, certificates of insurance, and the new insurance challenges posed by developing 21st century business models such as Airbnb and Uber. For me personally, I enjoyed the opportunity to see many industry friends and colleagues again. The insurance industry is truly a relationship business, and it is never more apparent than when everyone gathers for conventions such as this one. The MAIA membership and its supporters who attend this convention are the best of the best, and I hope that students are inspired to devote themselves to this industry based on the fine people they met this week. This entry was posted in Conference, Insurance, MAIA, Risk Management and tagged convention, insurance, MAIA, risk management on February 27, 2015 by drdavidallenbrown.